From Taipei, to travel to Jiufen 九份 by train, you would need to pass through Ruifang 瑞芳. Ruifang is a small township and a district in New Taipei City. It is also the gateway to Jiufen and Jinguashi 金瓜石, which used to be a Gold mining area. I heard that there are still some Gold beneath Jiufen and Jinguashi! But forget trying to dig the ground when you are there. The train journey from Taipei Main Station to Ruifang Station 瑞芳车站 takes about 45 minutes. I would recommend to book the train journey in advance and get a reserved seating which is pretty comfortable. Cost about NT59-NT76 (S$2.50-S$3.30). My friend travelled on a peak weekend and the train was so packed that she hardly even have a space to stand! From Ruifang, we transferred to a Keelung Bus to Jiufen. The bus stop is just outside the train station, at the corner of the road, just few steps away from the Welcome 顶好 Supermarket. Both bus 1062 (which is the same bus from Taipei) and bus 788 would stop here and proceed towards Jiufen. The journey takes about 15 minutes uphill and we could just tap our store-value EasyCard. You will be amaze by the skillfulness of the driver on how he maneuver the huge vehicle through the narrow and windy path uphill. If you have luggage or just too lazy to take the public bus, you can try taking a taxi from the taxi terminal on the left once you exit the train station. The taxi standard rate to go Jiufen is NT180 and will stop just outside the 7-Eleven at Jiufen. 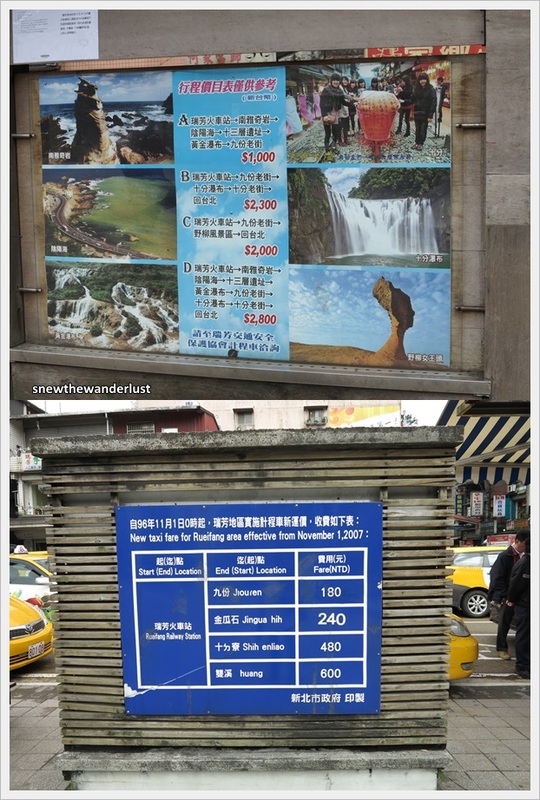 However, if you want them to take you right to the doorstep of your Mingsu 民宿 (bed & breakfast) at Jiufen (we stayed at Windsor B&B 温莎堡), it will cost NT200. You could also tour the nearby attractions around Ruifang District by taxi. The listed price are all stated clearly on the board. For us, we still prefer to rent a vehicle with a driver who act as our guide on a road trip along the North East Coast (which I will blog later). On our journey back to Taipei, we had some time before the train departure timing. 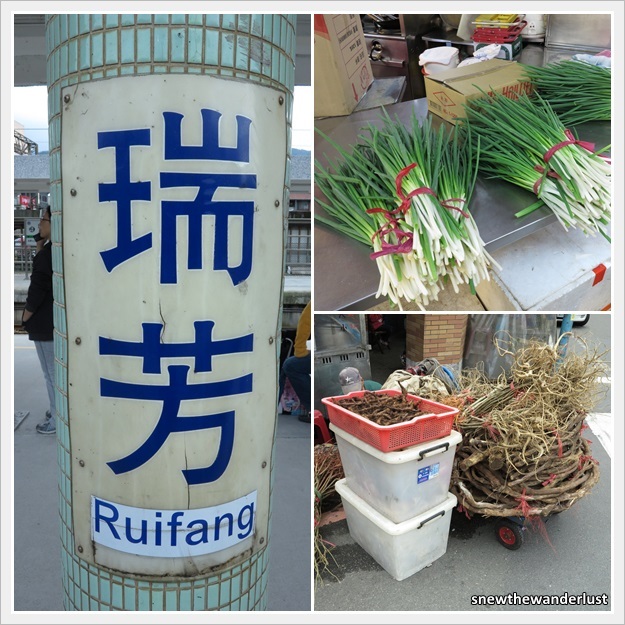 Hence we walk around the popular Ruifang Food Street 瑞芳美食街. The night food street was more bustling than the day. We passed by it our our bus journey to Keelung Night Market one of the nights. This is a covered food street with stalls. It was in about 2+pm and the stalls were just preparing for their business with not much customers yet. There was a long queue at the this street stall 阿霞龍鳳腿, selling 龍鳳腿 (literally translated as Dragon Phoenix Drumstick) just outside the covered food street. 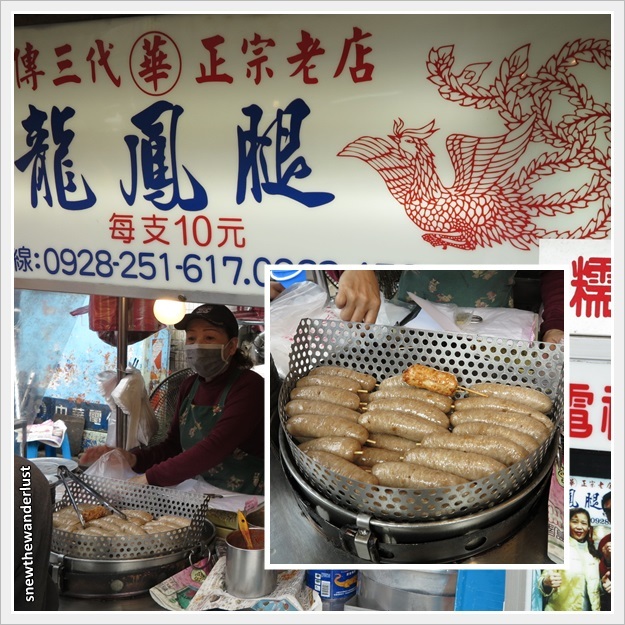 They are selling Fried Glutinous Rice Rolls and "Dragon Phoenix Drumstick" - which is a combination of fish paste and minced pork wrapped in bean curd skin. There were photos of celebrities patronising the stall on the street cart. It's really yummy and only cost NT10 (S$0.50) stick. Regretted only buying 2 sticks and not more! I would recommend to walk through the food street, especially as a night market. 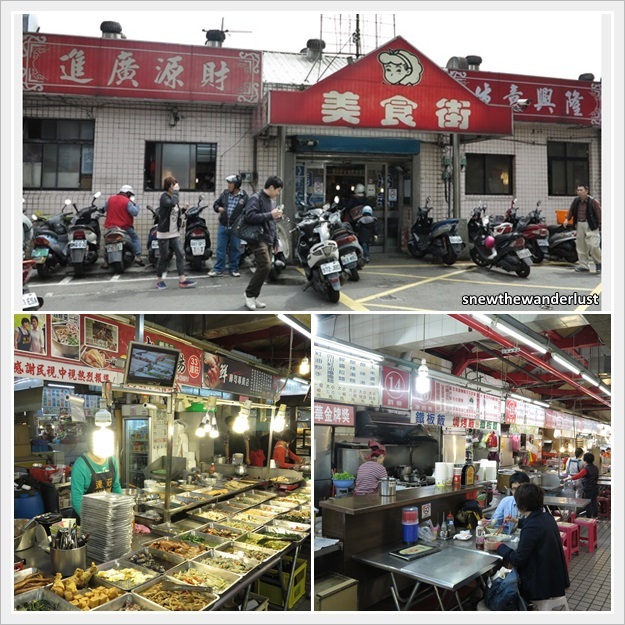 It would be a good place to find dinner if you are spending the night at Jiufen as most shops at Jiufen closes in about 6-7pm. Below are some interesting sights at Ruifang. The first picture on the right are spring onions. They are really much bigger and "healthier" then those found in Singapore. The right bottom picture shows the root of some plant that a hawker is peddling. I'm not sure what the root is meant for. Is it to brew soup? Do drop me a comment if you do know.